If you are a WordPress user, then chances are that you have come across the news that WordPress is developing a new editor. The current WYSIWYG editor will soon be replaced by Gutenberg – the new editor from WordPress. Currently, it is in beta testing and is slated to be released with WordPress 5.0 or higher. As the WordPress community shifts its focus towards being more user-centric and improve the ease-of-use of the software, Gutenberg is an important step in that direction. While there is a lot of development going on and we are certain to see some changes before it is launched, here is a quick look at what it offers. 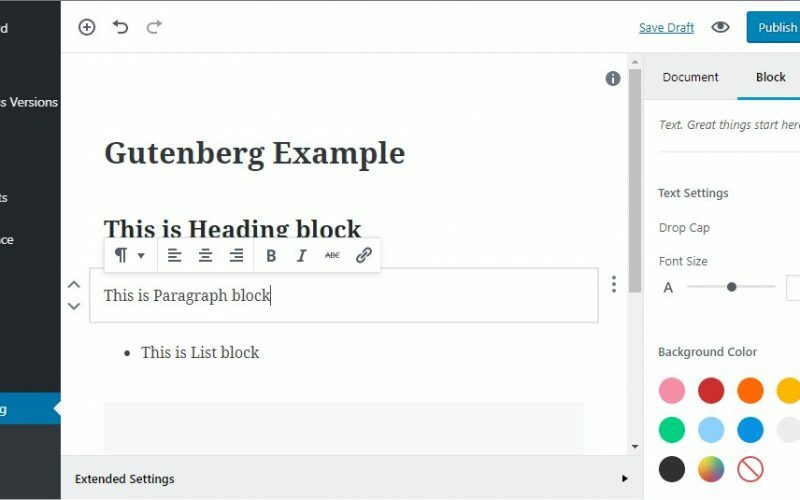 With Gutenberg, users will be creating blocks instead of the editor used today. These blocks will then be arranged individually. This will help simplify the site-customization process. There will be some common content blocks like headers, images, paragraphs and text-formatting blocks, layout blocks, etc. Embeds would be easy too. Like most website builders, you will be able to drag and drop content blocks making website building and customizing an intuitive process. The Gutenberg editor will also reduce your dependence on plugins, shortcodes, etc. What should existing WordPress site-owners do? Gutenberg has been designed to make website building easier and more user-friendly. If you are already running a WordPress site, then download the Gutenberg plugin and give it a try. You can find it through your admin dashboard. If you have some thoughts or feedback, ensure that you communicate it to the development team. Can I use the WYSIWYG editor after the release of Gutenberg? The WordPress team has confirmed that users will have the option of reverting to the old editor, at least for the initial months. Will my existing plugins work? Most of them would after being updated. Gutenberg-compatible plugins will be developed to leveraging the flexibility of the block system, making development easy. Will I be able to use my current theme templates? Yes, you should be able to use your current theme templates and also have an option of choosing from the new set of templates designed with the new editor in mind. The Gutenberg editor certainly has the potential to revolutionize content creation on WordPress much like Johannes Guttenberg revolutionized the written word by inventing the printing press. To truly realize the potential of this new editor, it is important that you have a reliable and secure Managed WordPress Hosting plan. While Gutenberg focuses on making the process of creation of a website easier, a good hosting plan with benefits like a feature-rich control panel, pre-installed Jetpack plugin, optimized database, automatic updates, and easy scalability, can ensure that building and managing your website does not take a heavy toll on your time and/or resources.